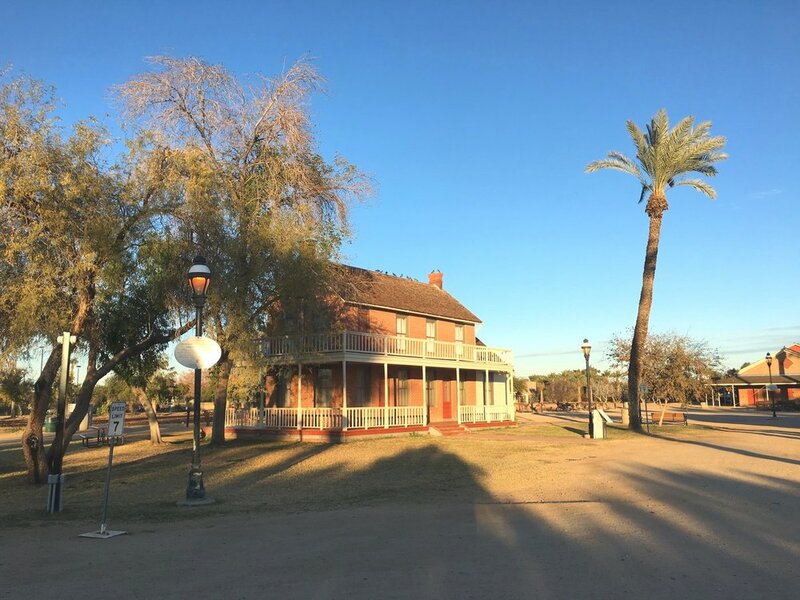 Saguaro Ranch Park is an iconic Glendale, Arizona destination. Growing up, I spent a lot of time at this park. It’s such a fun and magical part of this state. Not only for the historic buildings, that preserve the farming history of Arizona, but also for the peacocks who roam freely around the grounds. This park is an amazing gathering place for families across the state. It has baseball fields where groups get together for practice and tournaments. There are playgrounds, volley ball areas, soccer fields, and places to have a party. One of the best things about this park is the ramada area. It’s perfect for parties and BBQs with the huge grills! There’s counter space and sinks too. So you can really grill up some good food, while everyone has fun! Walking around Saguaro Ranch park, you’re sure to see the Peacocks! They roam free and are used to people, just don’t antagonize them! They’ve been there my whole life and little kids love to see them walking around. Sometimes they’ll even show off their beautiful tail feathers! As you walk the grounds you’ll see historic buildings that have been preserved. Some are even decorated with artifacts from the time, to give you a feel for the history. Not only are they full of history and a great way to learn more about Arizona, they’re also beautiful. You may recognize some of these buildings because they’re a popular spot for Christmas and Engagement photos. So you’re also sure to see a photographer when you walk around too! Finishing up your tour, you’ll notice the beautiful rose garden. During the winter it’s cut back but come spring, it’s a gorgeous site to see and smell! It’s also the perfect location for a wedding ceremony, which are also common during the year. So if you’re looking for an authentic Arizona Living experience, check out Saguaro Ranch Park! You’re sure to enjoy it and learn a little bit more about this awesome state! If you want to learn more, visit this website. Just outside of Cottonwood, Arizona is prime wine country. One of my favorite vineyards is located there, Page Springs Cellars! So one weekend, I headed up north to enjoy the cool weather and sip on some wine. When we arrived to the vineyard, we parked under solar structures that shaded the parking. This vineyard already had my vote, I love sustainability. From there we walked on to the beautiful property and requested a seat on the tasting room patio. It was busy and there was a short wait but nothing crazy. The tasting room patio is elevated and feels like a tree house. You can catch glimpses of the entire vineyard in the distance. We ordered food and drink, nothing was disappointing. The Strawberry salad was fresh and the candied pecans we're a delicious crunch. From the brick oven, we ordered a Meat Pie and it was beyond good! Plus the wine flight was a perfect pairing. After lunch, we went on the wine tour to learn more about the vineyard and the wine making process. It was so informative and led by a knowledgeable staff member, Lauren. She made the tour great, kept everyone engaged, and shared her passion. We got to try some of the red wine straight from the barrel! As the tour progresses you end up tasting 5 different wines during the tour. One especially stood out to me and so we decided to stay a little longer. After the tour we went to the Picnic Window to pick up a bottle of wine and a snack. We sat on a deck overlooking the Oak Creek, enjoying our wine. We walked the grounds some more before making the trip back home to Phoenix. Even before we left the parking lot, I was making plans to come back again! Last weekend, Shane and I decided to hit the road and head south of Tucson, to wine country! Yes, that's correct, southern Arizona is home to some well regarded wineries!